I set a goal of reading every day this summer and while there were days where I didn't manage to pick up a book I still made it through several from my stack and thought I'd share my thoughts today in case you're in the market for a good read. This was such a heartbreakingly honest account of what is happening in America right now. As a white reader, the experience this story affords its readers cannot be taken for granted. Inspired by the Black Lives Matter movement, this book takes you into the heart of Garden Heights after the main character has witnessed the wrongful murder of her best friend Khalil by a police officers. Being Canadian, as well as being white, I have the privilege of not having to deal with any of the things Starr deals with on a day to day basis but the experience of being alongside her as she grappled with the injustice of it all gave me a completely new understanding of what is going on in America. I obviously am not ignorant to it all, but this just felt like an honest firsthand account. It really is indescribable. This is such an important read and I highly encourage you to pick it up. There was a fair amount of language in it which, given the context, didn't seem gratuitous - but just be aware. I'm so glad I picked it up and will probably read it again this Fall. I ADORED this book! I was torn between wanting to read every spare minute I had so that I could know how it ends and not wanting the book to end because I was going to be sad it was over. The premise of the book is that the main character's husband is lost at sea in a helicopter accident and then years later she is engaged to someone else when HER HUSBAND IS FOUND!!! It's a crazy situation and really made me think. One minute I wanted her to stay with her fiance and the next I was rooting for her husband. I thought it was really beautifully written and I absolutely loved the characters. I didn't think it was too "cheesy" and couldn't have asked for a better ending. I read Everything Everything on the way to Colorado and I really enjoyed it. The main character, Maddy, has an immunodeficiency disease where she can't leave her house.... filtered air, no visitors... she pretty much lives in a bubble. Olly moves in next door and he and Maddy strike up a friendship that turns romantic. It felt a little bit "teen" at times, but definitely kept my attention and I didn't see the ending coming so that part was fun. What can I even say about Wonder?!?! I ADORE THIS BOOK!!! I feel like it should be required reading not just for kids (I would say 5th/6th grade and up) as well as the entire general population. Wonder is the story of a little boy, "Auggie", who has severe facial deformities and he's entering the 5th grade after being homeschooled for his entire academic career. The book is told by multiple points of view including Auggie, his classmates, his sister, etc. and each perspective is relatable and thoughtful. Wonder was real and honest and heartbreaking and inspiring. I fell in love with Auggie and found myself with a big lump in my throat multiple times while reading. It was thought-provoking and would be a great read for kids in late-elementary and/or early-middle school. I think that if I could only read one book over and over again for the rest of my life I would GLADLY pick The Nightingale. The book is the story of two sisters (and their friends, family, neighbors) living in occupied France during WWII. It tells the stories of the women and children left behind while the men went off to fight and the unimaginable circumstances and tragedy that they lived through. My grandmother lived in Holland while it was occupied during WWII and although I've talked to her about it on a few occasions this gave me a whole new respect and admiration for her and an insightful perspective for what she lived through. It was beautifully written and acutely poignant and I was sobbing poolside as I finished it. While the book was incredibly sad at parts - the resilience, strength and courage of the women was inspiring and uplifting. I had heard all kinds of great things about Crazy Rich Asians and ordered it on a whim. For some reason I was surprised that it was actually about crazy rich Asians :) I found the book to be extremely entertaining and interesting - probably because the kind of wealth and lifestyle in the book is SOOOO not something that I'm familiar with. It was funny and while some of the names were hard to keep up with at the beginning I liked it a lot and have the sequel in my pile of books to read next. I'd love to hear what book(s) you're currently recommending! What you've loved and what you're glad you invested your time in. What great recommendations! I really want to read Wonder before it comes out as a movie. Do you think it would be ok for my 9 year old to read? As a fourth grade teacher and a mom of a nine year old, I'd say yes! Yes! I read it last Fall. I also have a 9 y/o boy with Down syndrome. Unbeknownst to me, several of his friends from school since PreK read the book this summer (with their parent's guidance)....all of the kids said they loved to hear things from Auggie's perspective and it reminded them of my son and how he might be feeling. I think it led to some very worthy discussions about kids with special needs in a way that I or their parents could never accomplish. Wonder!!!! Isn't it the best? I teach 5th grade and reading Wonder with them is my favorite part of the school year. Even after having read it 5 times, I still choke up reading it to them each year. I loved Bear Town by Fredrik Backman, A Mother's Promise by Sally Hepworth, and It Ends With Us by Colleen Hoover. "All the Missing Girls," was one of my faves this summer! I read "The Couple Next Door," and to be honest, didn't love it. Like didn't love it skipped a few pages (a lot) and just read the last few chapters to see how it ended. It was just too much. Maybe you'll enjoy it more than I did! Oh my gosh-- I hated The Couple Next Door. I have to finish books once I start them, but I cringed every time I picked it up. It was SO disturbing!! I was a big fan of The Nightingale too!! I felt the same way about Crazy Rich Asisns. The names were confusing at first but once I got those down it was a good read! I am listening to Wonder on Audible right now and oh my goodness it is SO good! I agree that every person needs to read it. My favorite book of the summer has been This is How it Always Is by Laurie Frankel. I've read all the books except The Hate You Give and it is in my library holds. I loved all these books! I was in Costco once and someone was telling their child how poorly written Wonder was! I was stunned and wanted to argue but figured this person was crazy! The kids at our school read it. Such a good book! Yay I've been waiting for this post! Thanks for sharing all the reads you read this summer! Hope you are getting back into the swing of things with ease as the new year approaches! I named One True Loves my favorite book of the year way back in the spring. I'm still looking for something to top it this year...but so far, it's reigning supreme! That book is fantastic! The Nightingale was amazing and I also thought Crazy Rich Asians was too funny (and absurd if that is some people's reality!). I recently read Small Great Things by Jodi Picoult and The Handmaid's Tale by Margaret Atwood. I really liked them both. I hope you get to read a bit despite the busy school year around the corner! The Nightingale sounds like that could be my next book! If you liked one true loves, you have to read maybe in another life by the same author! It's so good :) I recommend it to everyone. Thanks for the reviews. I love how you put the quotes in your post. Wonder is one of my all time favorites, and I can't wait to see the movie this fall. Hate U give is on my to be read list, and you will love Light Between oceans! One True Loves is a favorite if mine as well. I think I will add The Nightingale to me list. I've heard a lot about it recently. I just finished The Tea Girl of Hummingbird Lane. My favorite book of the year so far. For anyone that has a connection to China adoption, I highly recommend. I usually see book suggestions and just go to the library. But I may have to buy One True Loves. I loved Wonder, too. Did you see that it has been made into a movie? I think it is released in December. I actually bought Crazy Rich Asians and I'm in thr midst of starting soon! I've been on a Elin Hilderbrand roll lately her booKS are so good! Have you read any of Jodi Picoult's books? I ordered Wonder for my 6th grader to read and now I will be reading it! I am also ordering The Nightingale. Love your book reviews! We have read a lot of the same books this summer! :). I definitely recommend The Light Between Oceans if you are deciding what to read first. It is long but so compelling! When you are done with the book, the movie for the Light Between The Oceans is amazing!!!! Wonder was amazing! I wanted it to stretch on. There are some short stories out there based on the same characters too. I have a lot of teacher friends who are planning to use it in classes this year. I can't wait for the movie to come out! They are making Crazy Rich Asians into a movie currently as well- I think it will be interesting to see the movie take on the book! As a fifth grade teacher I would say 9 is the youngest I would have read it, and then I would read it together. Leads to great discussions!! I have 30 copies and use it as a novel study every year. Amazing book. Another good one, Fish in a Tree! If you loved The Nightingale, you have to read Winter Garden, also by Kristin Hannah. It's my absolute favorite book! Thank you for the recommendation on Wonder! Adding to my list now. Nightingale was my favorite book of 2016. I never sobbed so hard for a book. Crazy Rich Asians was so entertaining, I agree. His next book is even better! The third one too! Awesome trilogy. I am reading crazy rich Asians right now and it makes me laugh lol! I may have to put Everything Everything & The Nightingale on my to-read list! Have you read The Couple next Door by Shari Lapena? Very good! I haven't read any of these so this is a great list for me! I just finished reading Hillbilly Elegy by J.D. Vance. It's a non-fiction memoir but the guy that wrote it is our age. He has a truly heart-breaking but redeeming story and lots of thoughts about why some people stay poor in America. I read One True Loves after you recommended it and I loved it! I'm not a big reader but several of the books you suggested sparked my interest- thanks! I read The Nightingale last year, and it is a book that I cannot stop recommending. I want everyone to read it! I will definitely be adding your books to my "next" list! I LOVE this post so much. I love how you included quotes (with very pretty fonts). You can tell you put a lot of thought into your blog posts. I've been a fan for YEARS. I LOVED The Nightingale- it is my favorite book of all time, ever. (and I read a ton). I loved Light Between Oceans (the movie is fantastic, too). I loved The Shoemakers Wife and The Help. And highly suggest The Invention of Wings. I read Wonder and One True Loves this summer too. The Nightingale is next on my list when Im ready to really sit down and READ. (There's just too much going on for me right now, but soon....) I'm going to add Everything Everything to my list too. Just finished Crazy Rich Asians and loved it! The sequels are in my to-read pile. I recently started Madam President by Nicolle Wallace and am really enjoying it. I bought it not realizing it was #3 in a series and now I want to go back and read #1 and #2, although I feel like I didn't need the first two to get into the third (clearly, as I started it two days ago and am 2/3 of the way through already). There is also a new version of Wonder- written by the same author- that is actually a picture book. It's a great way to introduce Augie to younger children who aren't ready for the chapter book version. I highly recommend. My Mom and I watched The Light Between Oceans (I had never read the book) and it was SO GOOD. I cried pretty much the whole way through. Parts of it were hard for me to watch and some of the time I was pretty much sobbing. I usually read the books before I see the movies, but I didn't have a chance to in this case, but the book is still in my list of things to read. I absolutely adored The Nightingale as well! Right now I'm finally reading Redeeming Love! It's been on my list for a long while! I loved One True Loves and The Nightengale (Kristin Hannah is my fave). I can't wait to see what you think of The Lifht Between Oceans bc I cannot for the life of my get through it. I'm reading the 2nd of a series by Pam Jeniff right now, the diplomats wife. I loved OneTrue Loves and keep meaning to read The Hate You Give. I've been reading Wonder to my class for years and can't wait for the movie. I also liked Save Me A Seat, Paper Things, and Lucky Broken Girl (all for kids). For adults I liked Space at the Table. Great recommendations! The Nightengale is one of my favorites. The slight between Oceans is also one of my favorites, although I don't really like the ending. I was a little floored to see our reading lists are almost identical- give or take a few books. I also share the same feelings about them :) I loved Everything Everything for what it was. 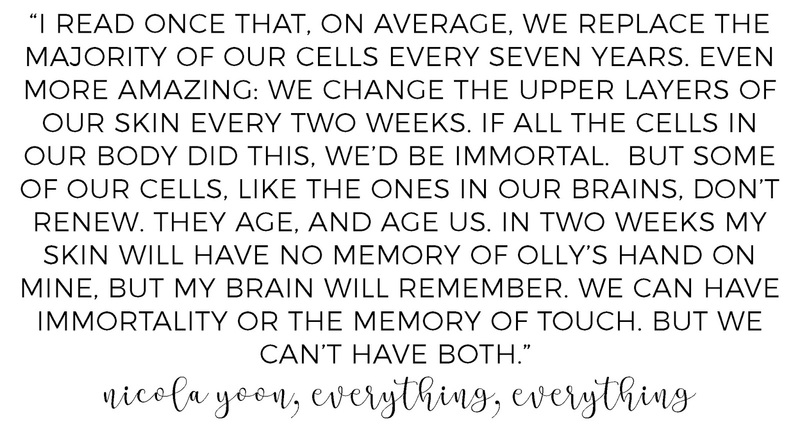 I think I was more in love with Nicola Yoon's writing than the story itself. Although still a sweet fun story. I love that she included diversity in her characters in a very subtle and real way. I have yet to read Crazy Rich Asians but it's in my August TBR stack. I am adding some of these to my "must read list." And I loved that you put quote before each book. Thanks for sharing!! The Light Between Oceans is my all time favorite book! I sobbed for a good 30 minutes after I finished it (in all fairness, I was pregnant 😜). So happy you read Wonder! My 9 month old daughter has TCS as does Auggie, and when anyone reads and spreads positive reviews of the books it inspires others to spread kindness! Thanks for sharing it on your blog! You rock! Great review! Excited to pick some of these up. I really cannot decide about the Asian series..the reviews have been so mixed and I just can't decide if it will work for me! With the books I have read that you reviewed I agree 200%!!! Add "It Ends With Us" - Colleen Hoover - if you have not yet read it. I thought One True Loves was going to be my favorite this summer but It Ends with Us was a difficult yet important story too. . .
Oh, and along the lines of "Wonder" - have you ever read "Out of My Mind" by Sharon Draper? Excellent, excellent read. I truly have never taught/thought the same way since reading it. The Nightingale is hands down my favorite book. I keep trying to find one like but haven't been able to do so. I need to read it again. If you liked The Nightingale then you have to read All the Light We Cannot See by Anthony Doerr. It's a little long, but the story is amazing (occupied France again). I can't wait for the movie!! !